The bell-like, resonant sounds result from the action of the work’s elements. Boursier-Mougenot’s attention to movement stems from his background in theater.2 Recognizing that he did not wish to be the performer onstage in his art, the artist has developed pieces for stand-in players—amplified beehives, live finches on electric guitars, cherry pits falling onto a drum kit, vacuum cleaners blowing into harmonicas, and helium weather balloons dragging around a tethered microphone. 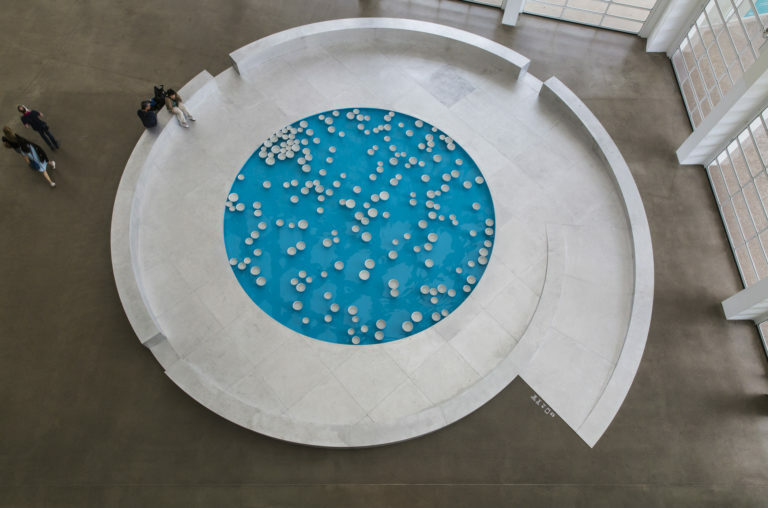 His large-scale installations and environments often bring together natural and manufactured elements. 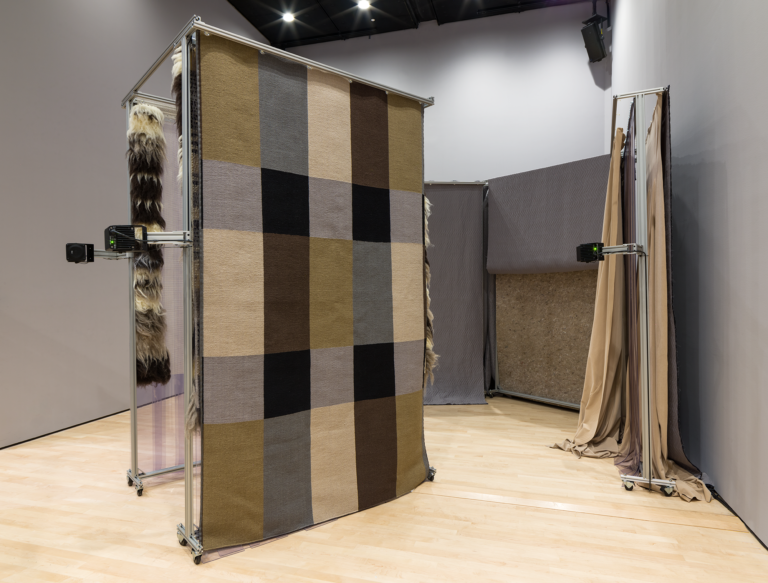 Boursier-Mougenot found in installation art a vehicle for achieving an atmospheric space, with multiple vantage points for visitors and no beginning or end to the composition, unlike the traditional concert. His clinamen embodies the compositional strategies of indeterminacy and the use of unorthodox instruments. 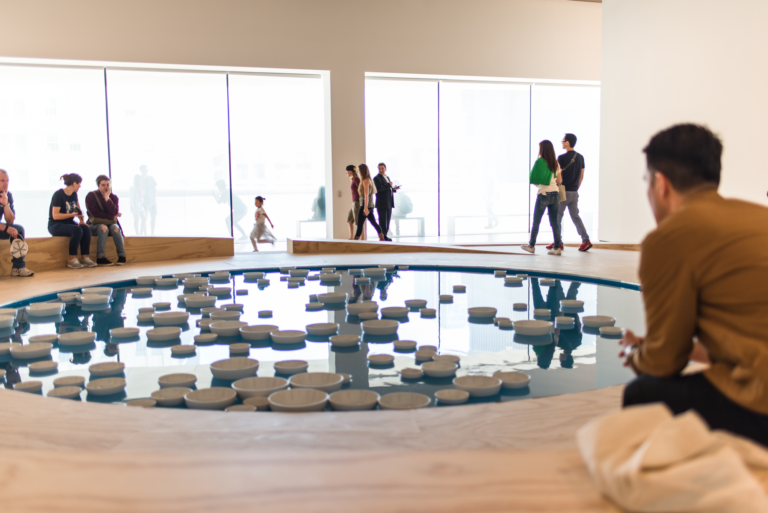 However, while the subtle collisions between the bowls suggest the unpredictable complexity of a stochastic pattern in nature, the artist has experimented with and refined all of the components over time—the shape and size of the pool or pools, the temperature and speed of the water, and the type, size, and number of floating vessels that subtly peel off to the left or right of a diametrical current directed at the center.3 For the artist, the configuration of elements in his generative systems is tuned to be “both operational and identifiable as the score of the musical form it produces.”4 His spatial choreography encompasses the wood spiral ramp with a perimeter bench developed for this third iteration of clinamen for SFMOMA’s presentation. 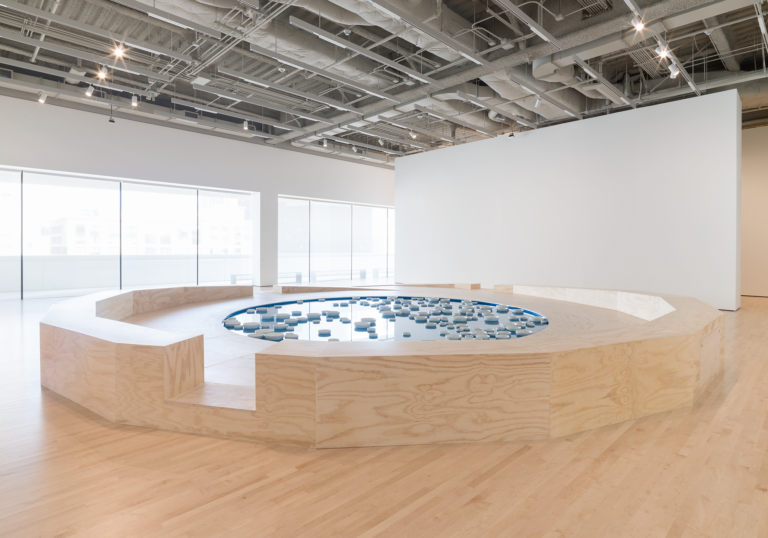 Echoing the visual flow of vessels in the piece, the design encourages visitor circulation around the space and onto the multi-sided structure. The title clinamen is derived from the Latin word used by the Roman philosopher Lucretius in his poem De rerum natura (On the Nature of Things) to describe the unpredictable swerve of atoms. This theory of Epicurean physics postulates a minimal indeterminacy in the motion of atoms—a spontaneous and minute curve or deviation in direction as they encounter one another in the void to form the matter of the world. This idea has often been invoked in debates about psychological determinism and free will. The variation within certain constraints in clinamen v.3 acts as a flow model of the creative condition. Céleste Boursier-Mougenot in “Zombie Choreography: A Conversation between Daria de Beauvais and Céleste Boursier-Mougenot,” in Céleste Boursier-Mougenot, ed. Frédéric Grossi (Dijon, France: Les presses du réel, 2015), 66. Boursier-Mougenot trained at the Conservatory for Music in Nice and initially worked as a composer for avant-garde music projects. From 1985 to 1994 he was the musical director for the theater company of Pascal Rambert, a writer, choreographer, and director. 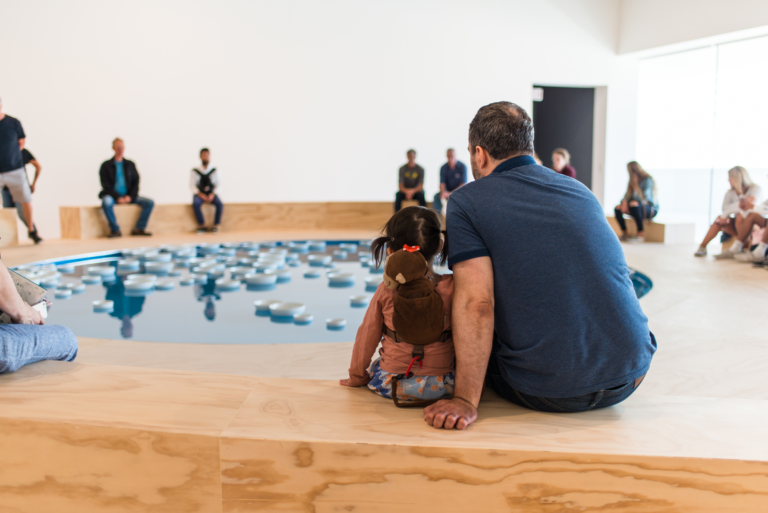 Since the earliest version of the concept, in 1997, the artist has made several untitled works with a similar principle using inflatable pools and, later, built pool installations. He began using the title clinamen in 2012. The porcelain he uses for these works, from the manufacturer Degrenne, is partly chosen for its sonority—the pitch and timbre it produces on contact. 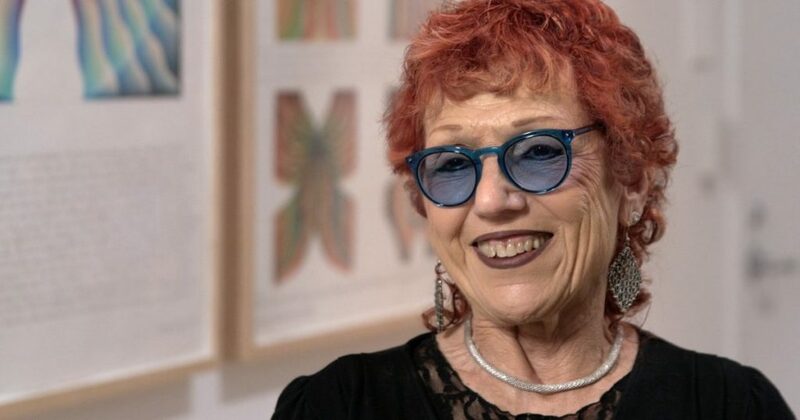 Tina Gelsomini, “Interview with Céleste Boursier-Mougenot,” The Seen, May 2, 2016, https://theseenjournal.org/art-seen-international/ear-v-19-musee-des-beaux-arts-de-montreal/.